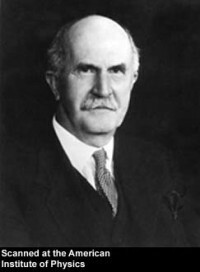 William Henry Bragg, although born at Westward, Cumberland, on July 2, 1862, lived most of his adult life in Australia, Leeds, and London. His family were farmers and merchant seamen. His mother was the daughter of a vicar. One of his claims to fame rests with his founding a new branch of science in 1913-14, along with his son Lawrence. This was the analysis of crystal structure by means of X-rays. That is, using X-rays to reveal the way in which crystals are built. He and his son were awarded the Nobel Prize in 1915 for this achievement. In WWI he did research on detecting and measuring underwater sounds. This was significant in locating submarines. For this work he received a C.B.E in 1917 and a knighthood in 1920. In 1931 he received the Order of Merit. In 1935 he was chosen as president of the Royal Society. Bragg's education was at Market Harborough Grammar School in Leicestershire where he lived with his uncles after the death of his mother when he was seven. He went to King William's College, Isle of Man, and Trinity College, Cambridge in 1882. In 1885 he moved to the University of Adelaide in Australia where he was Professor of Mathematics and Physics. Returning to England, he served as a professor of physics at Leeds and then at University College in London after WWI. He wrote a large number of scientific books. Sir William Bragg died on March 10, 1942. The lecture theatre at King William's College is named after him.